A clichéd post but one I always enjoy! I’m always clicking on what’s in my shower posts not just to see what products people use, but also their bathroom decor! Just me?! I don’t know what it is but we (i.e. the human race) are inherently quite nosey. We love to know what’s happening behind closed doors, or in this case closed shower curtains! So let’s get inside my shower, shall we?! 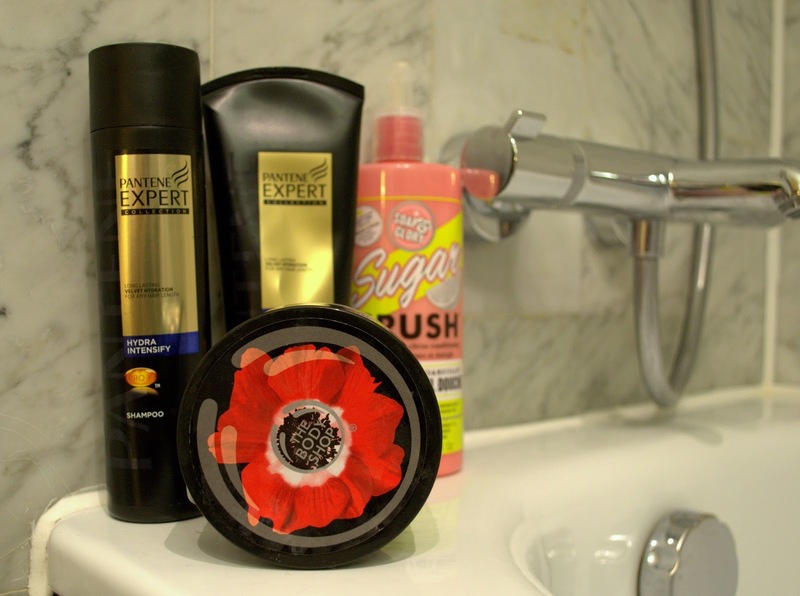 None of you should be surprised to see the ma-ss-ive bottle of Soap & Glory Sugar Crush Body Wash (£6.50) as you know how much I love their stuff! It smells so so good! It’s a sweet lime zesty scent that I can’t get enough of. These 500 ml pumps last like a year and are really handy to use. The shower cream lathers well and leaves my skin feeling clean and soft, no tightness afterwards at all. Not much else I can say about shower gel really, but I do love this! Another product that has been on the blog before The Body Shop Smoky Poppy Scrub (£13). This is by far one of my most used/preferred scrubs. It’s really creamy and has a lot of scrubby particles to slough away any dead skin. It leaves even my knees and elbows feeling really soft! Love how nourishing it feels on the skin and not rough at all. You can never scrub too much with this. It has been a blessing after my summer holidays when my skin just dried up like a prune from all the heat! On to hair care, I’ve coloured my hair a few times this year. So from complete virgin hair to a little too colour treated – my hair is not happy. I’ve been trying out all kinds of hydrating products on my hair! 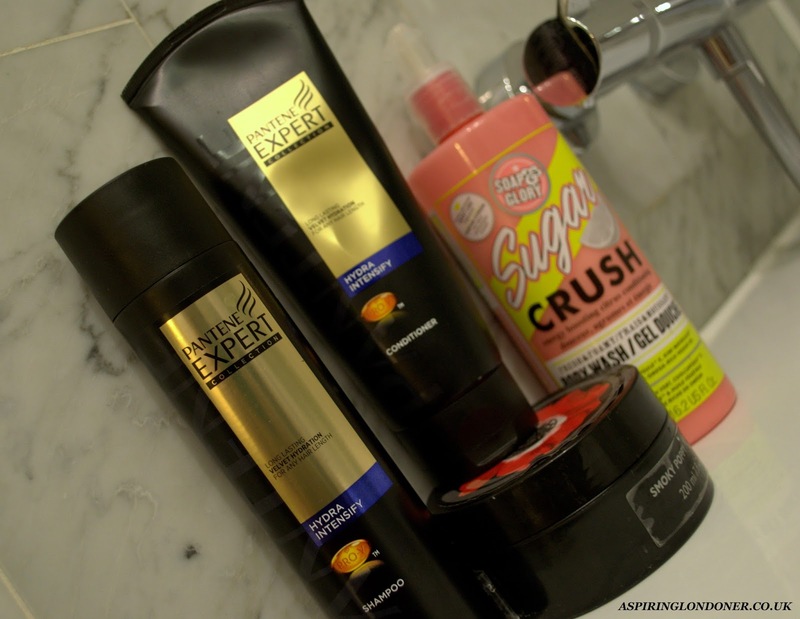 Pantene Expert Collection Hydra Intensify Shampoo and Conditioner (£5.99) has been the latest duo on trial and they’ve helped a lot. I like the packaging, although I do think the black kind of makes it look like the products are for men. That aside, the shampoo and conditioner are lovely. Although it's formulated for dry hair, it doesn't feel heavy on my hair at all. The shampoo lathers well without being too foamy and doesn’t dry my hair out. This is a problem I’ve had with other shampoos recently. And the conditioner is really nourishing. It feels light but does the job. My hair feels amazing after using both! My hair smells like I’ve been to a luxe spa afterwards. There you have it! I don't like using lots and lots of stuff in the shower as I want to keep it as simple as possible. I also really dislike having a cluttered bathroom. Despite being a hoarder, I have a one out one in policy for my shower/bath products. Have you tried any of the products in my shower? What's in your shower right now? Share recommendations in the comments below or tweet me @aspiring_london! So What's Multi-Masking All About?